Enter to Win a Whole Set of Brand New Helly Hansen Construction Gear! One thing’s for sure – construction workers aren’t all the same, so why should we all dress the same? That’s exactly the approach Helly Hansen took in designing its new Chelsea Collection of workwear. While you may picture technical outerwear for skiing or sailing when hearing Helly Hansen, the Norwegian apparel company was among the first to design and construct technical, trade-specific apparel for harsh conditions. Today, they offer everything from HI-VIS garments to specialty rainwear, layers, flame resistant styles and more. The new Chelsea Collection takes aim at tradesmen, offering them a modern alternative to workwear that lets them look and feel just as good in the field as they do after hours, at home or out on the town. 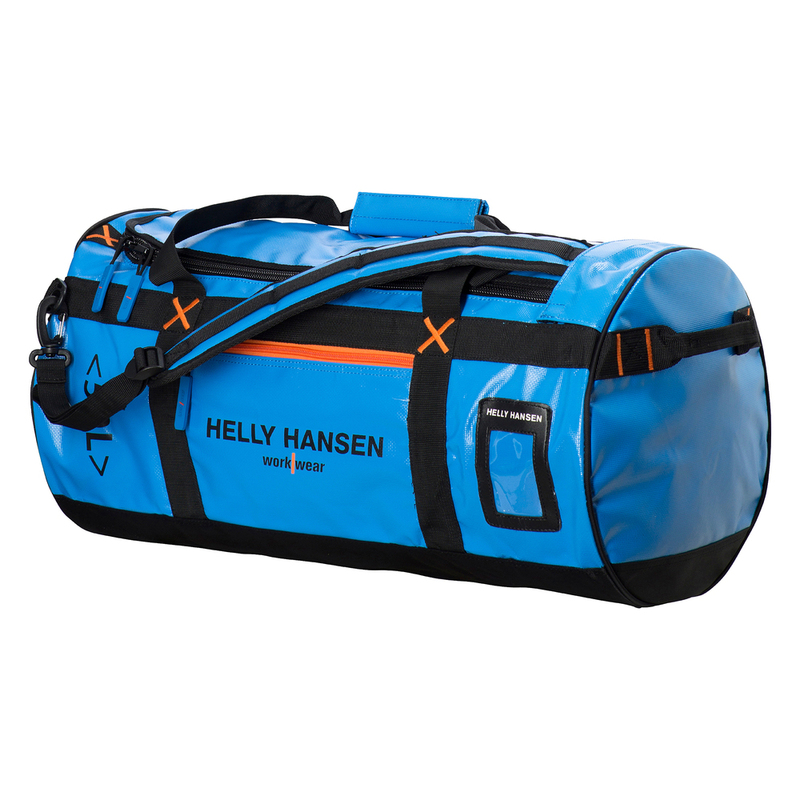 We ran into a few of the representatives from Helly Hansen’s new work wear line at the World of Concrete in Las Vegas last February and their booth may have made the biggest splash at the entire event. There were lines filling the aisles of people waiting to get their hands on some of this gear. Not only is the gear tough and rugged enough for all jobsites and all weather, it also brings your look into the 21st Century. Since the World of Concrete, we’ve teamed up with this exciting brand and we’re giving YOU the chance to win an entire set of Helly Hansen gear, including the Chelsea Construction Pant, Chelsea Jacket, Tech T-Shirt, Beanie, and a 50L Duffel bag! When we select our lucky winner, we’ll ask you for your size and preferences at that point. 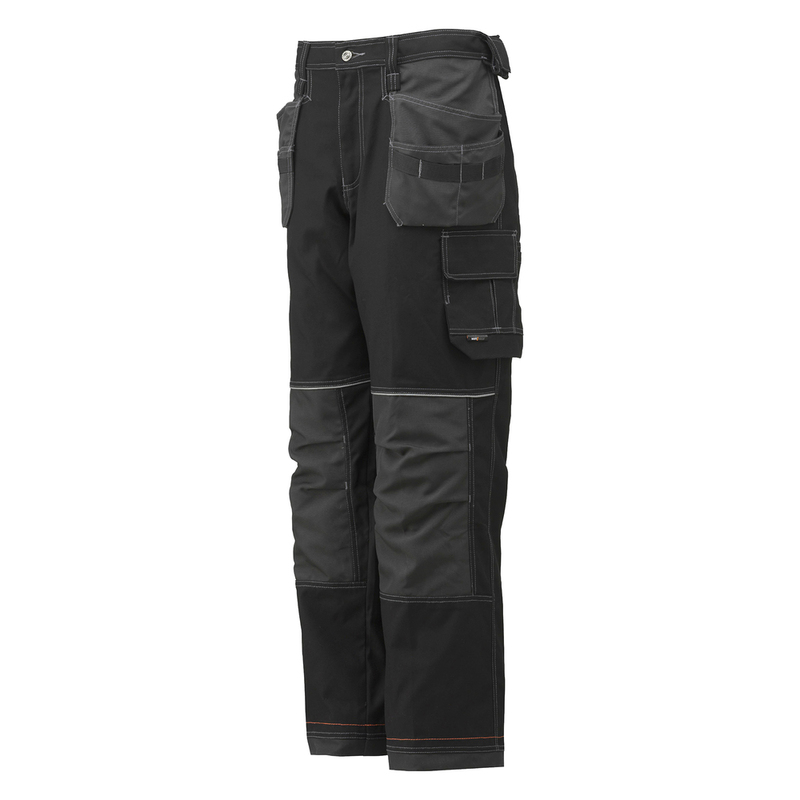 Designed for comfort, mobility, and durability, the Chelsea Construction Pant is a lightweight pant perfect for the job site. Hanging pockets are sewn into the hip pockets, allowing you to stash nails, pens and small tools close at hand, and they can be tucked in when not in use. 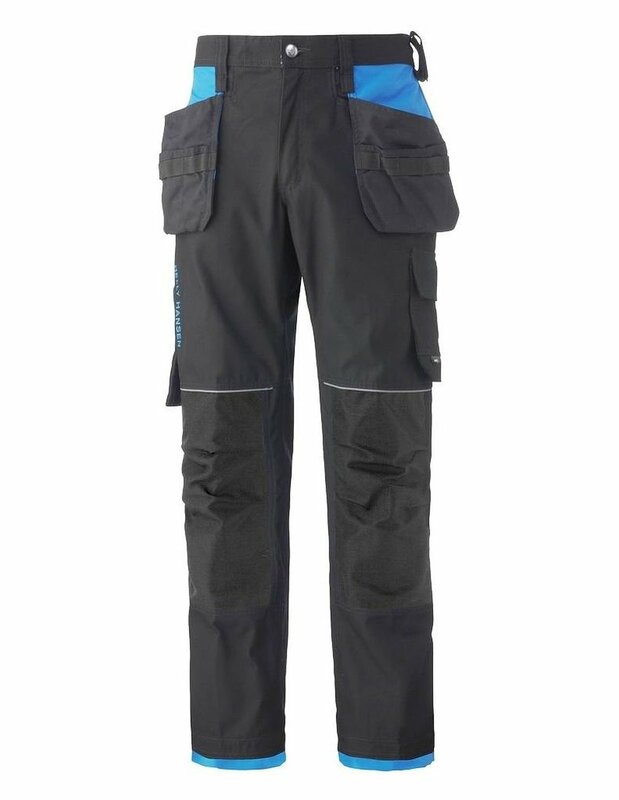 The knees are reinforced with Nylon Oxford 100% Polymide to resist damage, and also have internal slots for low profile kneepads (offered separately). There are reflective elements throughout, but they aren’t bright yellow or orange. The pants come in color combinations of black/charcoal and black/racer blue. 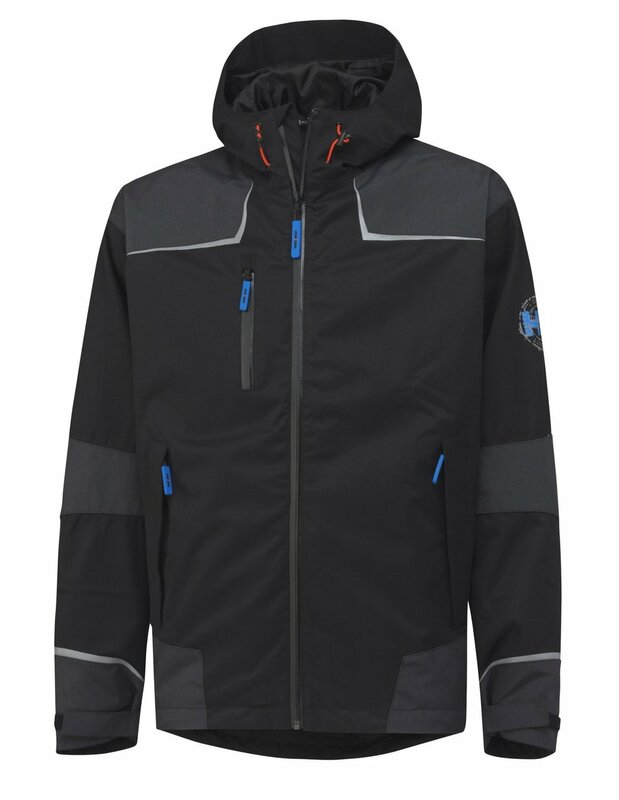 This high end shell jacket is waterproof, windproof and breathable, making it suitable for work in all weather. Just like the pants, reflective elements are added throughout the jacket and strategically placed reinforcements keep the jacket free of tears. This jacket actually just saved me from getting a bad cut on my back over the weekend when I scraped up against an exposed nail. My back is fine and my jacket showed no visible signs of damage. The Chelsea T-shirt is a 100% cotton tee with reflective elements built in throughout to keep you visible on the job. The knitted beanie is available in dark orange, race blue, and black. The 50L duffel bag, made of durable nylon, is weather resistant to make sure your gear makes it on site and stays dry. Or, just use it as a weekender bag. It’s available in black, racer blue, and black/yellow. Follow @ConstrJunkie and @HellyHansen on twitter and re-tweet our contest tweet, which is pinned to the top of our Twitter page and also embedded in this post directly below. Contest is now closed, please sign up for our email newsletter to be informed of future giveaways. Follow constructionjunkie and hellyhansen on Instagram and tag (3) friends in the comment section of our Helly Hansen giveaway contest post on Instagram by clicking the post below! Submit your email address to the form below. If you are already signed up for our newsletter, you will need to sign up on the form below again to officially enter the contest. No purchase is necessary to enter or win. A purchase will not increase your chances of winning. All Federal, State, Local, and Municipal Laws and Regulations Apply. Void where prohibited. By entering the Contest, entrants agree to abide by all of the terms of these Official Contest Rules and the decisions of Construction Junkie, LLC (“Sponsor”) and Sponsor Partner(s) whose decisions shall be final and binding. ELIGIBILITY: This contest (“Contest”) is open to legal residents of the fifty (50) United States and the District of Columbia who are at least 18 years or older at the time of entry. Employees of Construction Junkie or those directly affiliated with Construction Junkie and their immediate family members (defined as parent, spouse, child, siblings and grandparents) are NOT eligible to win. By entering any contest, entrants agree to waive any and all claims against Contest Entities for personal injury, damage or loss of any kind which may result from participation in the Contest or from the receipt, enjoyment, ownership or use of any prize. 1. Log on at constructionjunkie.com (the “Website”) and subscribe to newsletter via link to MailChimp.com. 2. Log into Instagram.com, find user “constructionjunkie” (the “Website”) and comment on the picture of the Helly Hansen Construction Apparel Kit giveaway giveaway by tagging (3) friends and follow “constructionjunkie” and “hellyhansen” on Instagram. Private accounts will need to be made public to enter. Per Instagram rules, we must mention this is in no way sponsored, administered, or associated with Instagram, Inc.
3. Log onto twitter.com, find and follow user “@ConstrJunkie” (the “Website”), follow @HellyHansen, and re-tweet @ConstrJunkie’s tweet about the Helly Hansen Construction Apparel Kit giveaway. Twitter users may need to make any private accounts public to be entered into the contest. This contest is in no way sponsored, administered, or associated with Twitter. Anyone found to have created multiple Twitter accounts to enter the contest will be ruled ineligible. Once successfully entered in the contest in any of the 3 ways listed above, the participant will be entered to win a Helly Hansen Construction Apparel Kit, approximate retail value of $400. Limit one (1) entry per person and (1) per email address the duration of the Contest Period, regardless of method of entry. Last day to subscribe and be entered is May 25, 2016. PRIZES: No transfer, substitution, or cash equivalent for Prizes. Construction Junkie, LLC reserves the right to substitute a Prize of equal or greater value if a Prize cannot be awarded as described for any reason. Limit: One Prize per person/family/household. Any Prize Winner shall sometimes be referred to hereinafter as the “Winner.” No transfer, substitution or cash alternative permitted, except by Construction Junkie, LLC in its sole discretion. The winning entry will be deemed submitted by the e-mail account holder associated with such entry, as solely determined by Construction Junkie, LLC. Warranty, insurance, registration, and any fees or costs associated with the prizes are the sole responsibility of the Winner. Prize is awarded “as is” with no warranty or guarantee, either express or implied. Winner agrees to look solely to manufacturer for any warranties on the equipment awarded. DRAWING AND NOTIFICATION: Winner will be selected in a random drawing from all eligible entries received, on or about ten (10) business days after the last day to submit entries, by Sponsor or its designee, whose decisions will be final. Winner will be notified by e-mail about ten (10) business days after the winner is selected. If Sponsor or its designee is unable to contact potential Winner by e-mail and/or if the potential Winner fails to respond to notification within ten (10) business days of issuance, the potential Winner will be disqualified and forfeit his or her right to a prize, and an alternate Winner will be selected. GENERAL: This Contest is subject to all applicable federal, state and local laws. If any prize or prize notification is returned as undeliverable, prize will be forfeited and an Alternate Winner will be selected. All federal, state or other tax liabilities (including income tax) arising from this Contest will be the sole responsibility of each prize Winner. Except where prohibited by law, each Winner’s entry and acceptance of the prize constitutes permission for the Contest Entities to use said Winner’s name, photograph, likeness, statements, biographical information, voice, and address (city and state) worldwide and in all forms of media, in perpetuity, without further compensation. This Contest is subject to these official rules. By participating, entrants agree to be bound by these official rules and waive any right to claim ambiguity in the Contest or these official rules. Winners and entrants also agree to release, discharge, indemnify and hold harmless the Contest Entities, and the officers, employees and agents of each, from and against any claims, damages or liability due to any injuries, damages or losses to any person (including death) or property of any kind resulting in whole or in part, directly or indirectly, from acceptance, possession, misuse or use of any prize or participation in any Contest-related activity or participation in this Contest. Any person attempting to defraud or in any way tamper with the Contest will be ineligible for prizes and may be prosecuted to the full extent of the law. Odds of winning depend upon the number of eligible entries received by Sponsor. LIMITATIONS OF LIABILITY: If for any reason the Contest is not capable of running as planned, including, but not limited to, due to tampering, unauthorized intervention, fraud, technical failures or any other causes beyond the control of Contest Entities which corrupts or affects the administration, security, fairness, integrity or proper conduct of this Contest, Contest Entities reserve the right to disqualify any individual who causes any such problem, and to cancel, terminate, modify or suspend the Contest. Contest Entities assume no responsibility for any error, omission, interruption, deletion, defect, delay in operation or transmission, or any problem or technical malfunctions of any telephone network or lines, or any combination thereof, which may limit an entrant’s ability to participate in this Contest. By entering this Contest, each entrant agrees that (i) any and all disputes, claims, and causes of action arising out of or in connection with the Contest or any prizes awarded, shall be resolved individually, without resort to any form of class action; (ii) any and all claims, judgments and awards shall be limited to actual out-of-pocket costs incurred, including costs, associated with entering the Contest, but in no event will attorneys’ fees be awarded or recoverable; and (iii) under no circumstances will any entrant be permitted to obtain any award for, and entrant hereby knowingly and expressly waives all rights to, punitive, incidental or consequential damages and/or any other damages other than actual out-of-pocket expenses. Each winner, by accepting a prize, agrees to release and hold harmless Contest Entities from any and all liability, claims or actions of any kind whatsoever, which may result from the receipt, enjoyment, ownership or use or misuse of such prize (including, without limitation, claims, costs, injuries, losses and damages related to personal injuries, death, damage to, loss or destruction of property, or any claims, costs, injuries, losses, or damages related to or based on the entrant’s rights of publicity or privacy, or the entrant’s claim that he/she has somehow been defamed or portrayed in a false light). Contest Entities do not assume any responsibility for any schedule changes in the Contest timeline, including without limitation, scheduling conflicts, labor strikes, Acts of God, or other unforeseen events that disrupt the Contest schedule. Contest Entities reserve the right to cancel, modify, or suspend this Contest. ALL ISSUES AND QUESTIONS CONCERNING THE CONSTRUCTION, VALIDITY, INTERPRETATION AND ENFORCEABILITY OF THESE OFFICIAL CONTEST RULES OR THE RIGHTS AND OBLIGATIONS OF ENTRANTS OR CONTEST ENTITIES IN CONNECTION WITH THIS CONTEST SHALL BE GOVERNED BY AND CONSTRUED IN ACCORDANCE WITH THE LAWS OF THE UNITED STATES AND THE STATE OF TENNESSEE WITHOUT GIVING EFFECT TO ANY CONFLICT OF LAW RULES OR PROVISIONS THAT WOULD CAUSE THE APPLICATION OF ANY OTHER JURISDICTION’S LAWS. THE INVALIDITY OR UNENFORCEABILITY OF ANY PROVISION OF THESE RULES SHALL NOT AFFECT THE VALIDITY OR ENFORCEABILITY OF ANY OTHER PROVISION. IN THE EVENT THAT ANY PROVISION IS DETERMINED TO BE INVALID OR OTHERWISE UNENFORCEABLE OR ILLEGAL, THESE RULES SHALL OTHERWISE REMAIN IN EFFECT AND SHALL BE CONSTRUED IN ACCORDANCE WITH THEIR TERMS AS IF THE INVALID OR ILLEGAL PROVISION WERE NOT CONTAINED HEREIN. EACH PERSON WHO PARTICIPATES IN THIS CONTEST AGREES THAT UNITED STATES AND THE STATE OF CALIFORNIA SHALL HAVE EXCLUSIVE JURISDICTION OVER ANY SUIT OR OTHER PROCEEDING ARISING OUT OF OR BASED UPON THESE OFFICIAL CONTEST RULES OR THE RIGHTS AND OBLIGATIONS OF ENTRANTS OR CONTEST ENTITIES IN CONNECTION WITH THIS CONTEST AND EACH HEREBY WAIVES ANY CLAIM THAT IS NOT SUBJECT PERSONALLY TO THE JURISDICTION OF SAID COURTS OR THAT ANY SUCH SUIT OR OTHER PROCEEDING IS BROUGHT IN AN INCONVENIENT FORUM OR IMPROPER VENUE.